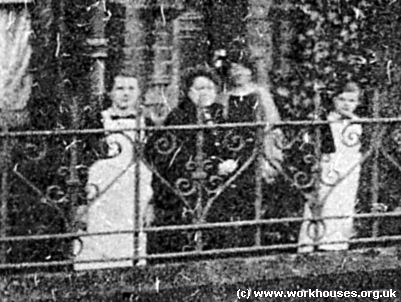 On 4th November, 1890, the Wolverhampton Union open a cottage home debelopment for its pauper children were opened at a 20-acre site on Amos Lane, Wednesfield. The homes were designed by G.H. Stanger and the scheme, whose construction cost about £20,000, could accommodate up to 240 children. The buildings included eight cottages, four for boys and four for girls, together with a master's residence, lodge, probationers' wards, infirmary, schools, swimming pool and workshops. The site layout is shown on 1902 map below. COTTAGE HOMES, WEDNESFIELD, NEAR WOLVERHAMPTON. 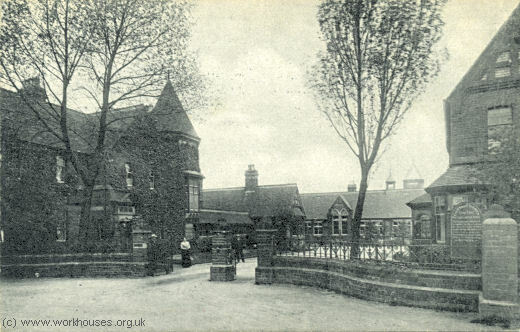 The above homes have been erected at Wednesfield, for the Wolverhampton Poor Law Guardians, for the purpose of removing the children from the workhouse, so that they may grow up free from the contaminating influence of the tramp ward, and with a better prospect of becoming useful members of society. The homes have been carried out from the designs and under the superintendence of Mr. Geo. H. Stanger, architect, Wolverhampton, whose plans were selected in open competition. The original design was for ten homes, each to accommodate thirty children, but of these, only eight have, at present, been built. Before the children are admitted to the homes, they are detained two or three weeks in the probationary wards of the lodge, in order to see that they are free from infectious diseases. Foster parents have charge of each home, the wife attending to the household duties, whilst the husband acts as an industrial trainer. 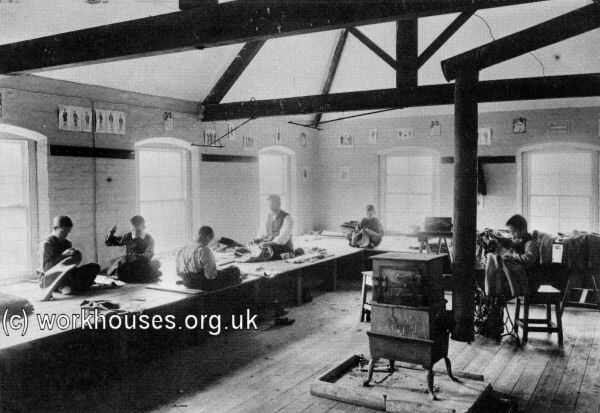 For this training, they have about twenty acres of land that is cultivated by the boys, besides which, they have a block of workshops containing tailors', shoemakers', tinmen's, and carpenters' shops, also a bakehouse, where all the bread used in the establishment, and at the workhouse, is made. At the back of the workshops a swimming-bath has been built. The schools are divided into separate departments for boys, girls, and infants, with classrooms for each, the main schoolrooms having glazed screens, thus making additional classrooms when required. A portion of the playgrounds are covered in to be used in wet weather. Messrs. Bradney and Co. of Wolverhampton, have erected the whole of the buildings from bricks made upon the site, with Stanton stone strings and dressings, the roofs being covered with red Staffordshire tiles. Wednesfield Cottage Homes bird's-eye view from the south, 1891. 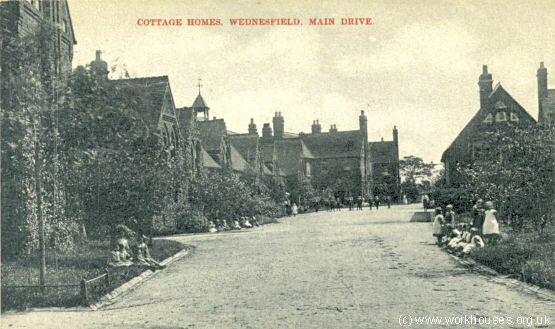 Wednesfield Cottage Homes entrance from the south-west, c.1913. 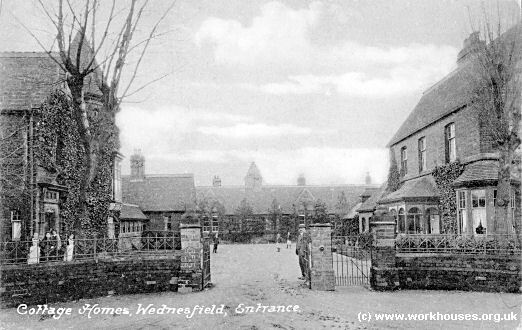 Wednesfield Cottage Homes entrance from the north-east, c.1910. Wednesfield Cottage Homes entrance (detail), c.1910. 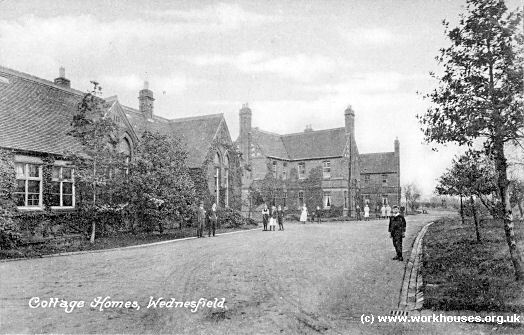 Wednesfield Cottage Homes main drive from the north-east, c.1910. Wednesfield Cottage Homes main drive (detail), c.1910. 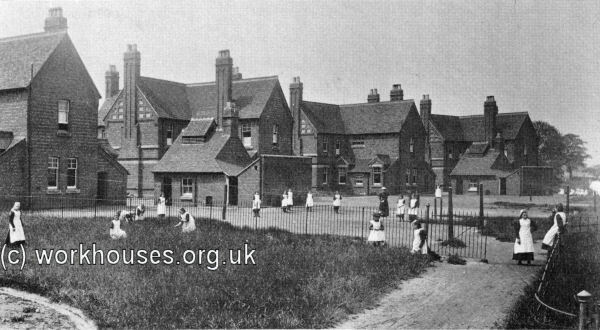 Wednesfield Cottage Homes girls' playground, date unknown. 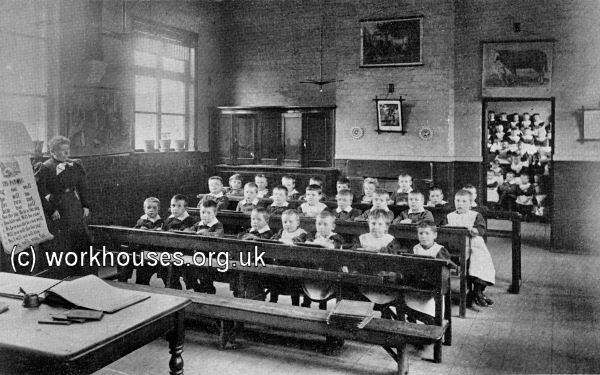 Wednesfield Cottage Homes classroom, date unknown. Wednesfield Cottage Homes tailor's shop, date unknown. After 1930, the cottage homes became local authority children's homes. The pairs of cottages at each end of the site were each joined together. Two of the homes were named Barrett House and Watterson House. They buildings have now all been demolished and a housing estate covers the site.